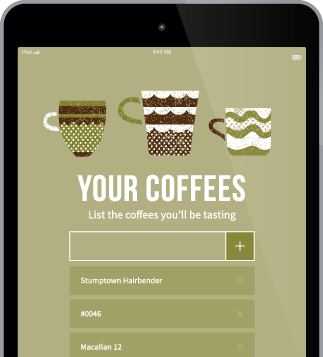 Our coffee app helps you learn about coffee. Record tasting notes, compare answers with pros, and remember all the things you've tried. Our app is available on iOS and Android, just search the app stores for "Angels' Cup". It's also available on any device with a web browser, including your phone, tablet, and computer. Just click the link below to launch it! You don't need to be a subscriber to make use of our app. It's a great way to record tasting notes on all the coffees you try, no matter where they came from. Beginner mode is a quick way to record tasting notes. 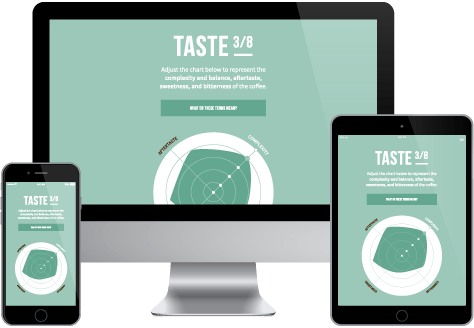 We've included a few tools such as this flavor wheel helps you visualize what you taste. Light to medium roast coffee is best for this, and make sure your coffee is a little cool for the strongest flavors to come through. Advanced mode adds a few layers to the tasting experience. Familiar with SCAA Cupping Protocol? Angels’ Cup is a little different, but you’ll soon feel right at home. When you get tasting flights from Angels' Cup, you can compare tasting notes with the roaster and other members of our community. Can you guess the origin,or pick up any hidden flavors and aromas? Keep track of how you brew your coffee and the resulting strength and extraction. Also get coffee-specific brew guides from the awesome roasters we've partnered with. These guides will get your coffee dialed in from the first cup to the last. Show your friends what a great cup of coffee you just had by sharing your tasting notes on Facebook, Twitter, and Pinterest. The coffee app is designed to help you learn about coffee, but it works even better with our coffee subscriptions. You'll get to blindly sample some of the best coffees, all with tasting notes from the roastmaster. Are you ready to begin your journey? You stay in Wonderland, and I show you how deep the rabbit hole goes.